Real Sound Lab's innovative speaker correction system provides high-precision equalisation tailored to your monitors and your room. The optional hardware element of the CONEQ system consists of a range of powerful digital equalisers. Monitor loudspeakers are, without doubt, the weakest link of every audio chain! The perfect loudspeaker simply doesn't exist; every design has a different blend of strengths and weaknesses, but the distortions inherent in current electro-mechanical transducers conspire to degrade the wanted audio signal in various frustrating ways. Of course, loudspeaker technology has improved steadily, if incrementally, over the last 100 years, but it is still very far from flawless — manufacturers simply choose different sets of compromises for their designs, to meet the required performance, size, and cost goals. However, the digital revolution has affected pretty much every aspect of the audio world, and loudspeaker designers are increasingly now integrating sophisticated digital equalisation techniques in an attempt to correct transducer deficiencies and to optimise loudspeaker system performance. One interesting variation on this theme is CONEQ from Real Sound Lab, a company based in Riga, Latvia. CONEQ is designed to measure electro-acoustic transducers such as loudspeakers, and then to calculate corrective digital equalisation to permit near-perfect performance. The corrective filters are applied to the monitoring signal chain using either bespoke hardware DSP equalisation or software plug-ins, depending on practical requirements and budget. The software is compatible with both Mac (OS 10.5.8 and higher) and Windows (XP SP3 and higher) operating systems. 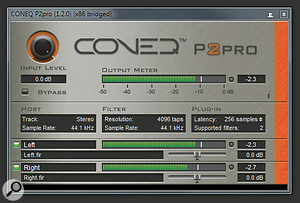 As an alternative to the hardware, the CONEQ filters can be implemented using a range of plug-ins. Many third-party 'corrective' equalisation systems obtain the speaker system frequency response by measuring the sound pressure level produced by the speaker under test on-axis, at a defined listening position — it is the obvious way to do it, after all. Armed with a system response, it is then fairly trivial to calculate the required corrective filter to address any response irregularities. However, the total contribution the loudspeaker makes in a control room must include the off-axis energy, which is not taken into account with simple on-axis measurements. As a result, while many corrective systems often deliver improved performance for on-axis listening, they frequently result in degraded performance off-axis, and the overall effect can be disappointing or unsatisfactory because the frequency response of the total energy in the room is unbalanced. Real Sound Lab's CONEQ system takes a subtle but significantly different approach: to determine the acoustic power frequency-response rather than the simple sound pressure level response, and adjust it so that the speaker generates the correct power spectrum across the listening area. The idea was developed by Raimonds Skuruls, who founded Real Sound Lab along with investor Viesturs Sosars back in 2004. Their technology is now available in various software and hardware products, as well as being licensed to companies like Panasonic and Hitachi for use in their flagship plasma TVs, Mitsubishi in their Immersive Sound Technology surround systems, and in some of JVC Kenwood's home audio products, among others. I should emphasize that CONEQ is designed to correct principally for loudspeaker deficiencies: it is not a 'room correction' system in the conventional sense. Very sensibly, Real Sound Lab state that room acoustic issues are best dealt with using conventional acoustic techniques. Having said that, the CONEQ system will inherently attempt to correct for some of the effects of room acoustic anomalies captured during the measurement process, such as direct reflections from a console or table top. The Starter Workshop program features an animation showing how to move the mic. Unlike most simple DSP equalisation systems, the CONEQ system doesn't measure from one fixed, on-axis position. Instead, the measurement process requires the measurement microphone to be moved continuously in a zig-zag pattern up and down, moving from left to right in an arc in front of the speaker being measured. In theory, the measurement mic should be moved across the surface of a complete sphere surrounding the speaker, but that is clearly impractical and generally unnecessary. Instead, it is sufficient, in most cases (assuming a reasonably well treated room), to measure across a surface representing the manufacturer's intended coverage angle. The distance between mic and speaker affects the accuracy of low-frequency measurement, and for reliable results the measurement microphone should traverse an arc at a distance which corresponds to between one and two times the speaker's largest cabinet dimension. Each speaker is measured separately, to generate specific corrective filters for each channel, but the process only takes about a minute per speaker. As the microphone is moved along its zig-zag pattern in front of the speaker, the measurement software generates a series of short signals. After about one minute, the software will have gathered around 180 sound pressure measurements from the space in front of the speaker, and these are used to calculate the corresponding acoustic power frequency response, in essence by summing the squares of all the pressure measurements at each frequency. The result of the calculation is the system's actual acoustic power frequency response and, since the desired target is a flat response, it is straightforward to calculate the required inverse filter needed to process the monitoring signal to achieve an overall flat response. The required level of precision would be impossible to achieve in the analogue domain, but it is relatively simple using a finite impulse response (FIR) filter running within a digital signal processor. By default, CONEQ uses a complex 4096-tap minimum-phase FIR filter to correct the power response anomalies. The 4096 taps refer to the number of simultaneous calculations employed to achieve the desired filter response. More taps basically means more precision, in this case allowing 5Hz resolution. The minimum-phase design mimics analogue filters in avoiding the pre-ringing effects associated with linear-phase filters — although that is an option, if preferred — and it also minimises the inherent filter latency. 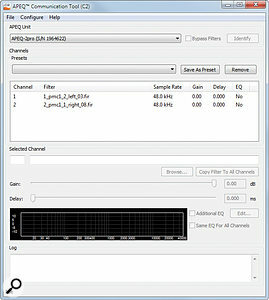 Once calculated, CONEQ's proprietary filter data can be saved as a small 13kb file for each measured channel to any convenient location on the computer. From there, it is loaded either into a software plug-in inserted in the monitor output path of the DAW, or into a dedicated hardware DSP equaliser wired into the analogue (or digital) monitor signal path. While the CONEQ FIR data format is proprietary, Real Sound Lab are working with third-party companies too. For example, the BSS Soundweb London 'BLU' signal processing and speaker management system, which is often employed in large-scale live-sound rigs, can accept CONEQ filter data to linearise PA speaker responses. However, the data has to be converted and exported first using the CONEQ Workshop software (see below). So that's the basic concept and process. How does it work in practice? 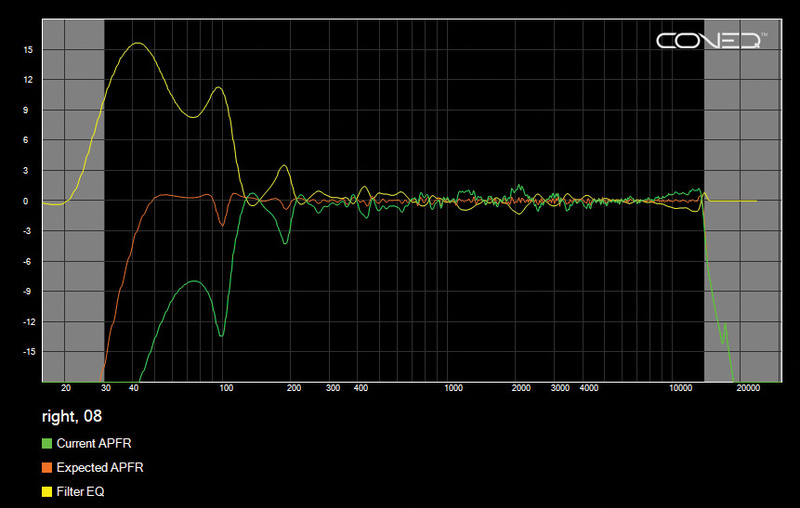 These plots show the original measurement (green), calculated filter response (yellow) and intended end result (orange) from the right of my pair of PMC DB1 speakers, mounted next to a large desk. The light grey areas are the 'out of bounds' regions where the software stops trying to correct the response. 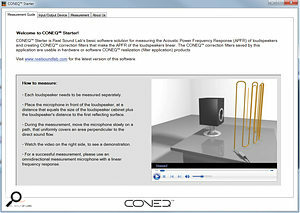 The measurement process is performed via a bespoke software program called CONEQ Workshop, which is licensed via a USB dongle using eLicenser technology. The Workshop software (currently v3.2) is available in three variants: Unlimited, Annual and Limited, the last being supplied as standard with any purchased CONEQ hardware or plug-in system equaliser. A cut-down CONEQ Starter version also exists, and provides the basic measurement and filter synthesis facilities, but omits most of the more advanced features of the full Workshop software. It is really intended to provide an easy introduction to the system, to get you up and running quickly and easily. Expanding on the basic functionality of the Starter software, the full Workshop version includes the ability to create correction filters (with either minimum or linear-phase responses) from multiple measurement sequences to improve accuracy. It can also calculate filters from imported pre- recorded files and there are facilities to adjust the maximum amount of boost or attenuation that the corrective filter is allowed to apply (to avoid overloading amplifiers and exceeding excursion limits of drivers). By default, the correction bandwidth — the frequency range over which the corrective filter is allowed to operate — is restricted to the range between the frequency extremes where the response falls by 6dB. However, this can be extended manually. A measurement microphone calibration file can also be imported to ensure really precise measurements, if necessary, and the FFT time window (used to exclude room reflections) and filter smoothing can also be adjusted. Clearly, there's a lot of tweakability on offer here for techy nerds to play with, and it's all explained well in the Reference Manual PDF file — but in reality, most users will not need to tweak anything, because it works extremely well in its default mode anyway. The initial measurement stage uses whatever audio interface is available to the computer, and there is a loopback test to check the linearity of the hardware and compensate, if required. The main process begins when you start a new Workshop project, plug a measurement mic into the interface input, and route the interface output to the speaker to be tested. (A good-quality, flat-response, small-diaphragm, omnidirectional capacitor mic will do if a proper measurement mic isn't available.) The input and output levels are then optimised and the measurement sequence can be started. 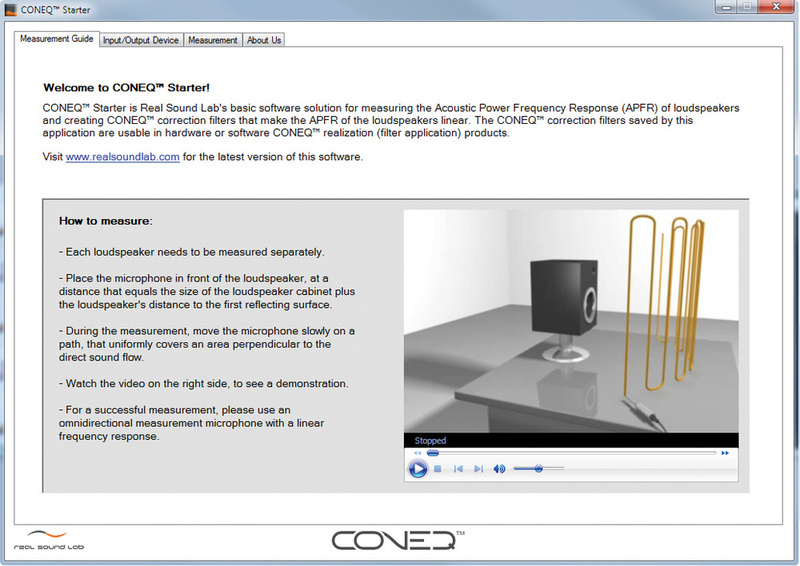 The Communication Tool is used to upload FIR coefficients to the APEQ hardware.The Starter version software automatically runs a synchronised, animated on-screen graphic that illustrates how and where to move the microphone, which is a useful aid as you get used to the CONEQ system. The animation isn't included in the full Workshop versions, but you'll know what to do by the time you're ready to explore that program! As the measurement sequence runs, a repetitive series of moderately loud 'chirps' is generated by the speaker. When it ends, the software takes a few moments to calculate the acoustic power response and then displays the measured response, the target and the corrective filter on screen. At this stage, you can modify the corrective filter response, if necessary, by changing the program parameters — extending or reducing the corrective bandwidth and boost/cut limits, for example. You can also introduce additional EQ requirements, perhaps to conform with the cinema industry's X-curve, for example. 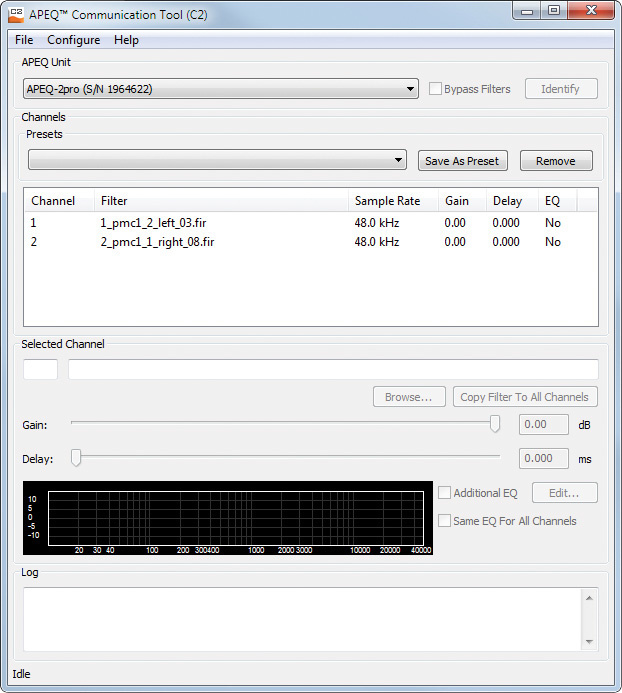 Once you are happy with the corrective filters — separate filters are normally generated for each channel tested, of course — they can be named and saved to a convenient computer location, from where they can be uploaded into a suitable CONEQ equalisation system. If a hardware DSP equaliser is connected to the computer, the Workshop program can upload the FIR data directly. Real Sound Lab currently offer three different hardware digital EQ units: the APEQ-2pro, the APEQ- 2pro DIO, and the APEQ-8pro DIO. As the names imply, these are two-channel and eight-channel variants (the last to support surround sound applications, primarily, but it could be used to correct multiple alternative stereo monitor systems). All three models feature balanced analogue inputs and outputs, while the DIO suffix indicates the inclusion of AES3 digital I/O as well. If a digital input is detected, it is selected automatically. Both two-channel units operate with a fixed processing sample rate of 48kHz, 24-bit, while the eight-channel model will process at all four standard rates between 44.1 and 96 kHz. All employ 4096-tap FIR filters which deliver 5Hz filter resolution, and the A-D and D-A converters in all three models are claimed to manage a dynamic range of 115dB (A-weighted) with THD below 0.01 percent. The nominal analogue I/O level is +4dBu, with a clipping level of +21.4dBu (+24dBu for the APEQ-8pro), and typical latency of 1.6ms. The digital input can accommodate any source sample rate between 44 and 96 kHz, 24-bit (up to 192kHz for the APEQ-8pro), and latency from digital input to digital output is 2.4ms. The review system included the APEQ-2pro DIO model, which is equipped with both XLR and TRS connectivity for the balanced analogue inputs and outputs, along with an AES3 input and output on XLRs, an RS232 serial control port (used only for service functions), and a USB B-type socket. The USB link is only required for uploading FIR filter data, which is done via a function in the Workshop program, or via the included C2 Communication Tool software; once configured, the unit runs stand-alone. The front panel features two momentary push buttons, each with status LEDs, to power the unit and bypass the DSP filters. (There is a proper mains isolation rocker switch on the rear panel.) There is also a simple four-LED bar-graph level meter, and the analogue I/O is hard-bypassed with relays should the APEQ suffer a mains failure. In normal operation, the bottom -48dBFS LEDs will be permanently on, with occasional flashes from the -12dBFS LEDs on high peaks. The top two LEDs (-6dBFS and Clip) won't normally illuminate at all. The eight-channel APEQ model differs from the two-channel units in several ways. It uses the ubiquitous Tascam D-sub connectors for the analogue I/O to save space, while retaining separate XLRs for AES3 interfacing. A word-clock input is provided on a BNC connector, along with an Ethernet port, while the USB socket is moved to the front panel. Either the Ethernet or USB ports can be used to control and configure the APEQ-8pro DIO, and the only switch on the unit is a mains on-off push-button on the front panel, while the metering has been extended to form a block of eight six-LED bar-graphs. The most significant difference, though, is the inclusion of a front-panel microphone input XLR (with software switchable +48V phantom power) to enable CONEQ measurements without a separate audio interface. Save for the larger analogue headroom and 192kHz maximum digital input sample rate, the technical specifications are identical to the two-channel models. It's even possible to tailor manually the responses generated by the Workshop software. The alternative to running the calculated filters in one of Real Sound Lab's APEQ hardware units is to run them using DAW plug-ins instead, and the CONEQ plug-in software is available in both VST and RTAS formats (currently 32-bit only) for compatibility with most DAWs, audio editing applications and computer operating systems. Ideally, the CONEQ plug-in should be inserted into a dedicated monitoring chain output bus, but if that isn't possible, it can be installed as the final plug-in in the master mix bus to correct the output for monitoring. However, in that situation it is obviously essential to bypass the CONEQ plug-in before the final mix is bounced or exported, to prevent the corrective filter equalisation becoming embedded in the mix itself! In a similar way to the APEQ hardware equalisation units, there are four plug-in variants. The P2 and P8 versions process two and eight channels, respectively, and use 1024-tap FIR filters to minimise the CPU load. The alternative P2pro and P8pro versions employ the full-fat 4096-tap FIR filter algorithms. The FIR length makes little difference when correcting the frequency response above about 600Hz, but it has a significant effect on the filter precision at lower frequencies. The 4096-tap filter enables frequency adjustments every 5Hz, while with 1024 taps, the resolution is only 20Hz. I used the VST versions of the CONEQ software mostly in Cockos Reaper projects, but also in Adobe Audition 3.0. The simple and Pro versions of the CONEQ interface essentially look and function identically. A rotary input-level attenuator is provided in the top left hand corner, with a bypass button immediately below and an output meter bar-graph to the right. Below that are status windows denoting the sample rate, filter resolution, audio format and latency (256 samples is the default, but it can be adjusted between 2 and 2000). The bottom of the plug-in GUI contains separate bar-graph meters for each channel and data boxes that denote the current FIR filter files. Clicking on these calls up a browser window for navigating to and selecting alternative FIR filter files. The APEQ-2pro DIO features digital as well as analogue I/O. The USB socket enables FIR coefficients to be uploaded. I used the CONEQ system to measure and correct a number of different monitoring systems I have to hand, using both the hardware and plug-in equalisers on different systems to correct their responses. In all cases, the results were definitely beneficial, although the actual level of improvement varied from virtually negligible to 'Wow!' — depending on the quality of the underlying system and room acoustics! Self-evidently, if a speaker is well-designed and has a pretty flat acoustic power response across the listening area, the CONEQ system will have very little to do. Conversely, if the speaker is poor, or located in a position that degrades its performance significantly, the CONEQ system can make a very substantial improvement. The plots shown here illustrate an extreme example of correction obtained with a pair of little PMC DB1 speakers positioned temporarily on high stands at the sides of a large office desk in a small, nearly square room, about 18 inches in front of the back wall and suffering from hard reflections from the desk surface. Subjectively, the bass response from this configuration was extremely weak, and the mid-range was noticeably coloured by the desk surface reflections. 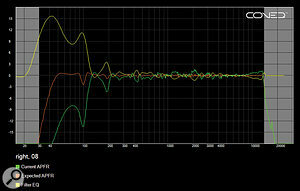 After a couple of minutes spent measuring each speaker (I used an NTI calibrated measurement mic connected to a GML preamp and RME AIO interface), and a few more minutes fiddling with the correction bandwidth and EQ limits, I was able to install the resulting FIR filter coefficients into both the P2pro plug-in and the APEQ-2pro DIO hardware. To correct the bass response, I had to allow the system to introduce some pretty extreme bass boost — about 16dB at 40Hz, in fact — and not all speakers would have the headroom to cope with that. Fortunately, these little PMCs are remarkably robust and capable, and I don't monitor at silly levels anyway, so there was plenty of untapped headroom in the Bryston 4B amp I was using at the time. I should stress that I wouldn't recommend this as a practical solution — dealing with the room's horrendous acoustic properties with bass traps would be a far better (and probably cheaper) approach! — but it does highlight the system's capabilities rather well. As the plots show, the response corrections through the mid-range were relatively small, with a couple of little 1.5dB peaks at 178 and 580 Hz, and a slight 1dB dip around 1kHz, which indicates the inherent quality of this speaker design. Switching in the corrective filters using either the hardware or plug-options provided exactly the same quality of correction and improvement, although I found the hardware solution slightly more practical in my application, because it meant I could use the speakers with sources other than the computer. In cases where the monitors are always used to audition the output of a DAW, the software plug-in would be an entirely satisfactory and considerably cheaper option, of course. The audible improvement in this lashed-together DB1 office system was nothing short of miraculous. The bottom end not only regained all the bass I normally associate with the DB1s, but actually the performance was enhanced, with much of the weight and solidity of a far larger system set up in a far better room. That was a phenomenal result that went far beyond my expectations. While the bass improvements were surprising and obviously hugely beneficial, there was no doubt that the mid-range also sounded noticeably more transparent and neutral. Bypassing the correction filters unmistakably confirmed the improved clarity and sense of openness, and more natural timbres to voices and acoustic instruments, in particular. I'm not going to claim that the CONEQ system is able to elevate the little DB1s to match the quality and resolution of high-end three-way monitors, but the improvement in mid-range clarity was very audible and definitely worthwhile, while the corrected bass response turned a completely unworkable setup into a reliable reference monitoring system that enabled me to deliver decent, transferrable mixes — a situation that was completely impossible before CONEQ correction. I've used several room and speaker corrections systems over the years, but the only one that really impressed me with its ability to bring genuine improvements (without trashing the sound elsewhere in the room), was the very expensive French Trinnov system. However, I am very pleased to be able to add the Real Sound Lab CONEQ system to my list of useful loudspeaker correction candidates. The irony with systems like this, of course, is that they make the most impressive difference with poor monitor speakers, but for the cost of poor monitors plus this kind of correction tool, you might just as well have bought better monitors in the first place, that potentially wouldn't need correction! However, placement issues and local acoustics can degrade the performance of even the best monitors, and in those situations the CONEQ system is a very useful means of regaining the quality in a remarkably simple, reliable and user-friendly way. A free demo version of the software, with simple measurement and filtering capabilities, can be downloaded from the Real Sound Lab web site and, if you have access to an omnidirectional small-diaphragm capacitor mic, I urge you to give it a try. The Trinnov Optimizer ST is a cut-down, stereo-only version of the original multi-channel Optimizer hardware system, which runs proprietary software on a bespoke computer platform to provide phenomenally powerful speaker and room correction. The three hardware CONEQ equalisers are the APEQ 2-pro, APEQ 2-pro DIO and APEQ 8-pro DIO. Suggested retail prices (including German VAT at 19 percent) are €1190$1500, €1547$1950 and €4165$5250 respectively. At the time of writing, software pricing is subject to change, so check the Real Sound Lab web site for the latest information. The three full versions of the CONEQ Workshop software differ in the length of time over which they operate. The eLicenser dongle supplied with the Unlimited version runs straight out of the box forever, while the other two will only work once the dongle is authorised on-line, and then only for a predetermined period. The Annual edition runs for 53 weeks (but can be extended by purchasing a new licence), while the Limited edition runs for 30 days once activated. That's more than enough to measure a few systems and create and fine-tune the appropriate filter files. 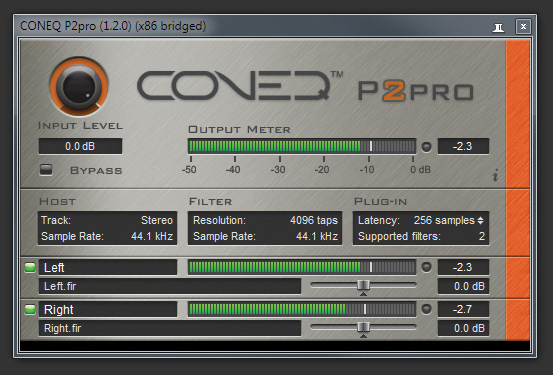 There are four versions of the CONEQ Filter plug-in: the 1024-tap P2 and P8, and the 4096-tap P2-pro and P8-pro. 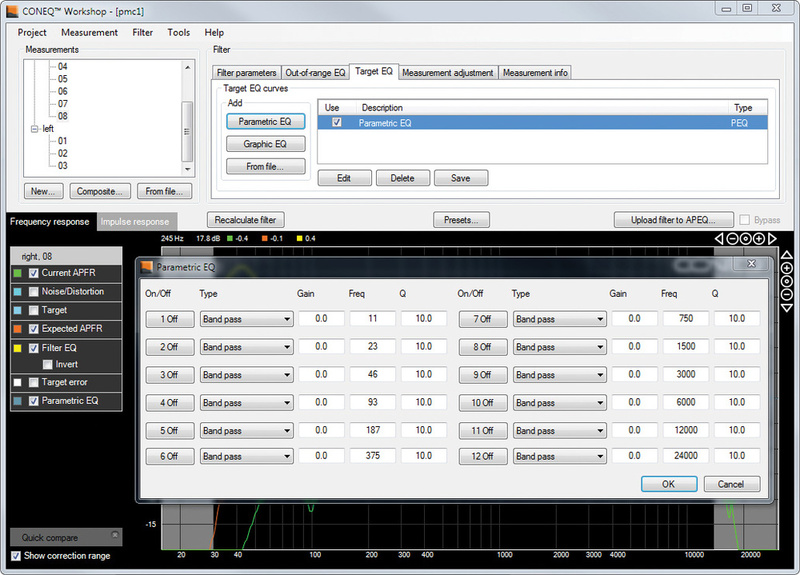 Easy-to-use measurement software, with useful advanced-user options. Capable of very impressive results even in extreme situations. Software EQ plug-ins are cost-effective. Hardware EQ units provide very flexible alternatives. Compatibility with BSS live-sound systems. Initial measurements requires decent test mic and interface hardware. The hardware EQ and unlimited Workshop software options aren't cheap! No corrective EQ system can deal with fundamental acoustic room anomalies. It might be better to invest in better quality monitors, rather than use CONEQ to try to improve inherently poor speakers. A unique loudspeaker-correction system based on assessing and correcting the acoustic power response of a loudspeaker across the listening area to improve its performance and accuracy. The calculated correction filters can be implemented using bespoke plug-ins or dedicated hardware units.